Recipe 49: This is something I was waiting to cook since 2 months…more or less since we started to see some sun in London and we began to organize picnics in the parks. Finally I never did it and this Ferragosto was just the right occasion! So here is the simple but delicious recipe. The ingredients for 3 people are: 300gr short pasta (I used fusilli), 1 can of tuna (or you can do without if you are vegetarian, and it’s going to be great anyway), 2 little bags of little mozzarelle or 2 mozzarelle to cut in pieces, some cherry tomatoes, some pitted black olives, oregan, fresh basil, salt, pepper and olive oil. Boil the pasta in some salty water until al dente or even a bit before. Just to give you an example on the english ( and I have to mention this because if it’s not an Italian brand you need to be even more careful ) pasta bag there was written 12 minute and I take the pasta off at 8 minutes because was al dente…not to hard or with flour taste, but not even melted. Drain the pasta and pass it under cold running water to stop the cooking process. Then place it in a big container and add some olive oil. 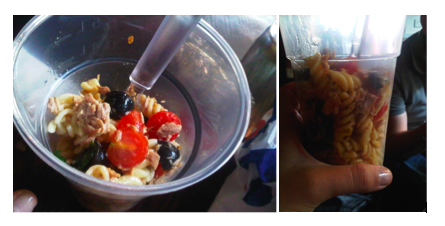 Mix until all the pasta is divided and start to add the ingredients: cut the mozzarella, the cherry tomatoes and the black olives in half. Then add the tuna, the fresh basil the origan, salt and pepper. Mix it all with some more oil if needed and be ready to eat! We used plastic glasses instead of plates and it was great! It’s a good solution for lunches in the park. Enjoy! Recipe 59: This is a classic of my mum’s dinners with guests. It’s something she used to do very often when i was little because it’s a very easy starter but really good and everyone like it. She call them the salty candies o caramelle satate! Ingredients for 4 people: Buy some puff pastry or brick leaf (you can find this in Waitrose), 2-3 frankfurters, one mozzarella, 1 egg and some olive oil. The preparation it’s very very easy: just stretch the puff pastry until very thin and cut it in squares. If you are using the brick leaf instead you will need to double each of them and cut it in some big pieces. Then cut the frankfurt and the mozzarella in pieces and put one of each in the little pastry squares or brick leaf. Using the pastry you will be able to close them exactly like a classic candy and they will look really nice. If you are instead using the brick leaf you will need to close it like little sack and you will need a tooth peak for each. Once ready, place them in a baking pan and pour on the top some olive oil or, if you have a brush, you could apply some egg. This is very important especially when you use the puff pastry, because it will be the final nice color to the candies. Put in the oven for 20 minutes at 180 but check it often just to don’t make them burn. Serve it without stick if you can take it away and enjoy! 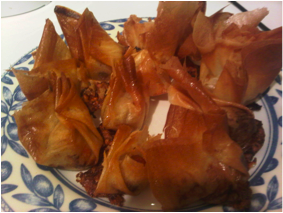 These instead are the ones made with puff pastry! And now, after the recipe i give you a little update before the holidays: i have reached – 6kg and this thanks to some alcohol free weekends, after lots of weeks of parties, and thanks to a bit of sport more. I mean i needed to, considering i will comeback in Italy for 2 weeks and there will be really hard to don’t fell in temptation with the food. So let’s hope it’s not going to be a massive disaster otherwise i won’t be able to lose other 4 kg before january! PS. Mamy te le ricordi le caramelle! queste sono sempre state una delle mie ricette di punta! facile rapide e che piacciono a tutte. Avevamo un po’ di questi fogli di pasta sfoglia a casa e ho pensato di fare questi sacchettini, visto che la vera forma di caramella non tiene con questi. E visto che non avevo uova le ho spennelate con un pochino di olio e son venute bene! ah sono scesa un altro kg, giusto in tempo per le abbuffate campigliesche! Speriamo bene! Ci vediamo tra pochissimo! Recipe 60: Do you have friends coming at the last moment, or you just want a quick and nice recipe for your dinner? Here is one i tried last week. I came back home quite late and i wanted something quick to prepare but tasty, so i opened the fridge and i found some peppers and mozzarella… so here it is! Ingredients for 2 people : 200gr of short pasta (i used the orecchiette because they can maintain well the sauce and the little pieces of ingredients, thanks to their shape), one pepper, olive oil, one mozzarella (if you have buffalo mozzarella it’s even better or you can use just cream), basil, Parmesan, a garlic clove and cherry tomatoes if you like. The first one is the easiest one. Just cut the pepper in little pieces, put some oil in a pan and let cook a clove of garlic in it. When goldish take it out and put the peppers to cook. In the meantime boil some water with salt for the pasta and cut the mozzarella in little pieces. When the pepper is soft and well cooked, add some mozzarella and let it melt. When the pasta is ready just add this to the pan with pepper, mozzarella and oil and let it take all the sauce. Serve it in a plate with Parmesan and the dish is ready! The second option is to put some cherry tomatoes with the pepper and the oil in the pan and some basil leaves and let it cook. Then you can add the pasta, while you will put the buffalo mozzarella and other basil leaves just on top, fresh and tasty, without not even Parmesan. This is a bit more exclusive and summery! Finally another sauce that i love it’s with peppers and cream, so exactly the same procedure than before, but instead than mozzarella you put a bit of cream in the pan and you add the pasta. I would serve it with some Parmesan too, But i advise you this is better in winter considering the cream it’s quite heavy. PS. 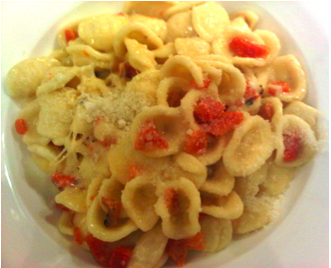 Mamy questa ricetta l’ho fatta rapida rapida con cio’ che ho trovato nel frigorifero, ma ti diro’ che l’accostamento con le orecchiette ci stava benissimo. Certo ad averci la mozzarella di bufala sarebbe stato diverso, ma tutto questo formaggio che filava con i peperoni, non e’ male per niente! Recipe 71: Perfect as a starter, but also as a family maincourse, especially if you have children at home… they will love it. My mum used to do it often because it’s very easy, cheap and i just couldn’t stop to eat them. In the weekend i invited an italian friend at my place and when i gave her the crostini, she was just so happy! It a classic also in her house! Ingredients 2 people: 6 slices of bread, 2 or 3 anchovies in olive oil, 1 mozzarella, and some butter. Nothing else! Cut the bread in little squares. You can also cut the borders if you want. Put them under the grill with a little piece of mozzarella on top and wait for 5-10 minutes. In the meantime take the anchovies and cut them in little pieces. Put some butter in a pan and on a low fire and add the anchovies. Let the butter melt and in the meantime, with the help of a little spoon, press the anchovies and mix them with the butter. After a bit this will take the consistency of a cream. If you want and you have it, you can also add some “anchovies paste”, but then put just one anchovy. When the mozzarella will be melted and the bread will be crunchy, take them out of the oven and just place on all of them a bit of the anchovies and butter cream! OK maybe the look it’s not amazing, but the taste you can believe me it’s really good! Just try! It’s so easy…and leave a comment here after please! PS. Mamy te li ricordi i mitici crostini di alici che mi piacevano tanto??? avevo comprato le alici per il vitel tonne’ e non ho potuto resistere! Anna ed io ci siamo leccate i baffi! Penso siamo ritornate indietro di 20 anni! Recipe 81: Big announcement this weekend. The figs are arrived in the supermarket! OK these are not the best figs ever, very sweet and soft, but they are good enough to have another classic italian dish for a light lunch or starter. Ingredients: you will just need 4-5 figs, some Parma ham, 1 mozzarella, 4-5 tomatoes, 1 avocado or only some basil leaves, salt and olive oil. For the Prosciutto e Fichi, just peal the figs and cut them in half. Put the ham on a plate with them and that’s all. To make the dish a bit more complete, just add the Caprese salad: cut the mozzarella in slices, then wash the tomatoes and cut them in slices too and serve in a plate placing them alternately. Then if you want, you can just add between the slices some basil leaves as we do in Italy, but otherwise you can also peal an avocado and add some slices of this too. With some olive oil, salt and pepper the dish will be ready! PS. Mamy lo scorso fine settimana non ho potuto resistere a prosciutto e fichi! quando ho visto i fichi al supermercato per quanto piccolini non ho potuto fare a meno di prenderli. 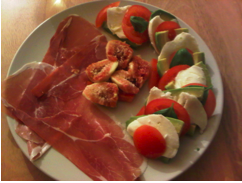 E con un po’ di prosciutto crudo ed una caprese, mi sono fatta proprio un bel pranzetti all’italiana!